I’d like to see Lord Caudecus’s Sword & Pistol skins available again, as well as the Outlaw outfit. I’m a relatively new player so I’m not sure when they were last available, but they’re the only items I’m after. Found out I started playing a week after the vouchers for outfit & weapon skins ceased to be sold on the gem store. Feels bad. Please, a sale on Bank Tabs and other utilities/upgrades for Halloween. Thank you. Nothing makes me more sad than when another chair or stool enters the Gem store or game. Not because I don't agree with the idea of them being ingame - quite the contrary - I love the idea of this game having such a wide array or expertly designed items. It really brings the community together. But why, why are there restrictions on where I can use my items? The first example of many that enrages me is the nightwatch stool. It was advertised with a little story about keeping watch while others are asleep, hence why it has a light. Not only does it look cool, bring to mind feelings of selflessness and the escapism of micro-roleplaying whenever we want, it (I thought) would encourage people to keep watch (including me) at towers and keeps in WvW. At the moment there is only one commander I follow that rewards people for refreshing siege, keeping watch, running dollys and other tasks that are not zerg or kill. I thought, this is perfect for me while I watch 8 out of 10 cats does countdown, unwind from a stressful day, and keep an eye on our T3 keep or towers. Sometimes I don't have the energy to do a propper world boss, zerg, or pvp. Don't get me wrong, I can understand the reluctance to put the functionality of chairs in pvp (though it would be funy). But why not WvW? An addition that might also be nice, have a counter on the post that indicates how many spaces on the map are available once it gets to a certain threshold. Who is also waiting for a Moa as Raptor Skin since there were these funny Moa races in "Old-Lion´s Arch"? Please bring back the dragon horns boxes!!!! need them to complete the dragon mog/cosplay!!! Maybe I'm not in the right place for ideas or at least try. Can I have a little love for Norns women? If you sell Mount Packs; I'm sure they'd sell better if there was also a corresponding outfit. I noticed that the Exo-Suit Mount Pack went down to 1200gem on the last sale and we have 2 Exo-Suits, 1 Dynamics and 1 Inquest MKII, which I surmise made the pack more appealing as it completes a theme, more people bought it and it went on a bigger discount for everyone else from now on (at least I hope that's the case). So the Mad Realms Mount Pack could do with a themed outfit to complete the ensemble. I'm players would love to run around wearing a ethereal outfit in the same style as this pack. Also; Charr Mechs Mounts and Sylvari Plantbeast Mounts (we have Fern Hounds, why not 'Fern Raptor/Springer/Skimmer/Jackal/Griffon'?). 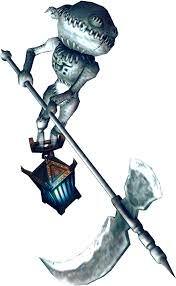 I'l like to suggest a staff (or a whole weapon set) with an ethereal look, like the Emissary's Staff or the Envoy Scythe, but with a bluish color scheme that would match Ad Infinitum. Formal military uniform/dress uniform (outfit): we already have special armors and weapons for the three orders, I think it would be nice if we have dress uniforms as well, it could even have capes or those fancy peaked cap (just don't make the characters bald please) or draw elements from the three orders or based on Pact aesthetic. Summer clothes / swimsuits (outfit): I've been dying for these to come out ever since I saw Kasmeer in her swimsuit, this outfit would have each races have their unique style as well! (I think I saw the fanart/concept of those said outfits on twitter), it would be nice if there's a special summer event going on in Southsun as well to go along with it. Library or bookshelves in home instance where the players could store their books or gizmos (like Parables of the Gods, Memory of Vlasts, etc), would be nice if the players could view special cutscenes that's been unlocked in their personal stories/living stories. 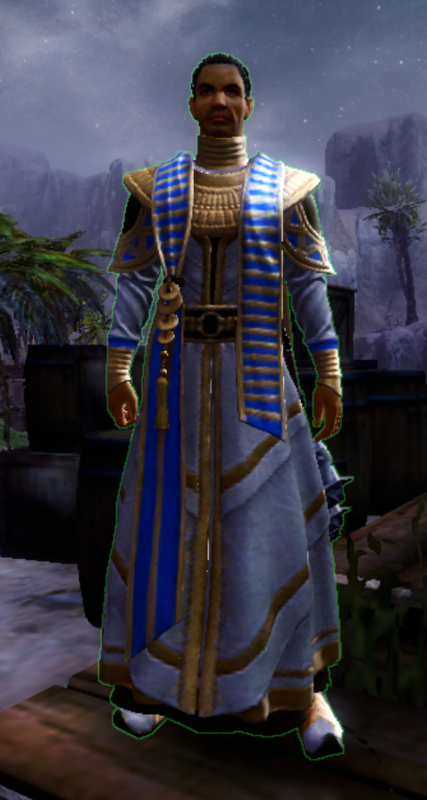 Other than that, I was hoping for Rampart, Strider, and Incarnate armor to come back to the gemstore. I would like to see a choya mail carrier. Maybe he could be running around wildly throwing envelopes in the air? I need more choya stuff! It's been a while since PoF came out so someone else might have already suggested this, but the clothes/uniform Order of Shadows agents wear would be amazing as a player outfit! Let's have a hand lantern skin for torch, can be great for Halloween. Kinda like "The crossing" staff. Improvements to hairstyle and makeover kits. Often times, after using the hairstyle/makeover kit, I find that the appearance in-game is very different from the makeover preview window. It could be that it looks odd in motion, or the lighting in the preview window is very different from in-game, etc. This makes me not want to take risks with hairstyle and makeover kits. When a player consumes a hairstyle or makeover kit, add a soulbound item in the character’s inventory that allows that character to change appearances as many times as the player wants for 1 week. This way, if the changes don’t look right in-game, the player can change more times without penalty until the player can finalize the look in-game. 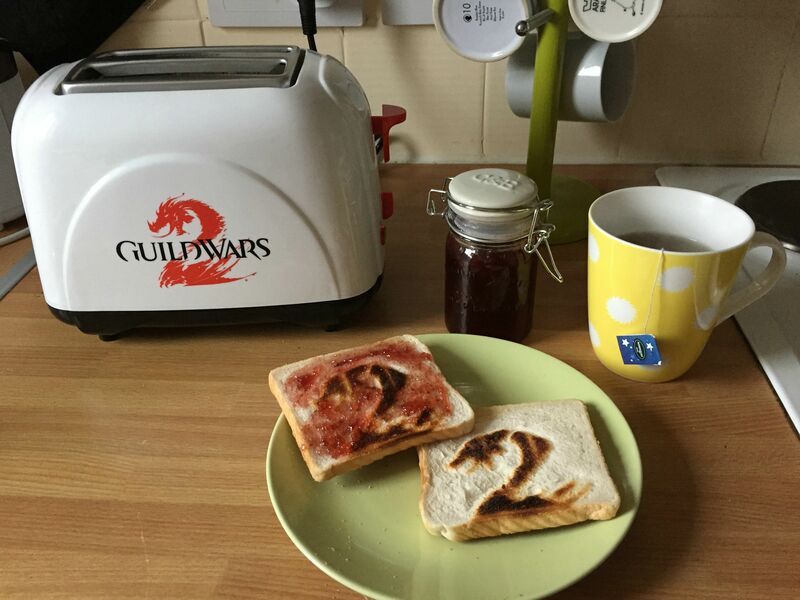 From the Extra Life stream: a GW2 Toaster mini. And maybe it leaves little GW2 scorch prints behind it or something like that. Suggestion for a new(kinda) armor piece. From the Cooks outfit make the boots as a seperate armor piece. Map Discovery Pack. Since we have the central tyria waypoint pack, why not have a similar pack but for zone discovery in central tyria? Since discovering a zone doesn't count for map completion, it'd be nice to have. Priest of Kormir outfit, please. Le bring back Zodiac armor sets please? I don't know if that has been asked before, but I would love to have more female noble outfits. Not that the one already existing is ugly, just that to me, it really looks unpractical and I feel claustrophobic just looking at it. It bothers me that my character wouldn't be able to run in that kind of dress. I really love those two dresses the non-playable noblewomen wear and I would definitely buy them as outfits for my guardian. She's a noblewoman and it's a bit of a shame that she never gets to simply relax around in a beautiful gown. I also would love more skins for quivers. I recently made the Bower's Delight quiver and love it, but while it looks amazing on norns and humans, it doesn't go well with my sylvaris who are dressed in cultural armors. I would love to be able to buy a sylvari-themed quiver skin, or to make it in the mystic forge. I love the design of the Fire Quiver: it's slim and elegant. The problem with Rox's Quiver or the Bower's Delight, apart from the fact that they are not sylvari-themed, is that they are too big and clip easily with the armor, while the Fire Quiver does not. 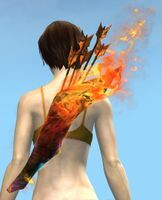 The Fire Quiver has the perfect shape and I would love to have a sylvari-themed quiver in that shape, only with leaves instead of fire. Not something too obnoxious, but an elegant leafy quiver that would easily blend in with sylvari cultural armor. And since I'm talking about backpacks, I'd love to have one like the one we get when we carry around Glint's egg. New Novelty Chair: Wintersday Blanket Pile. 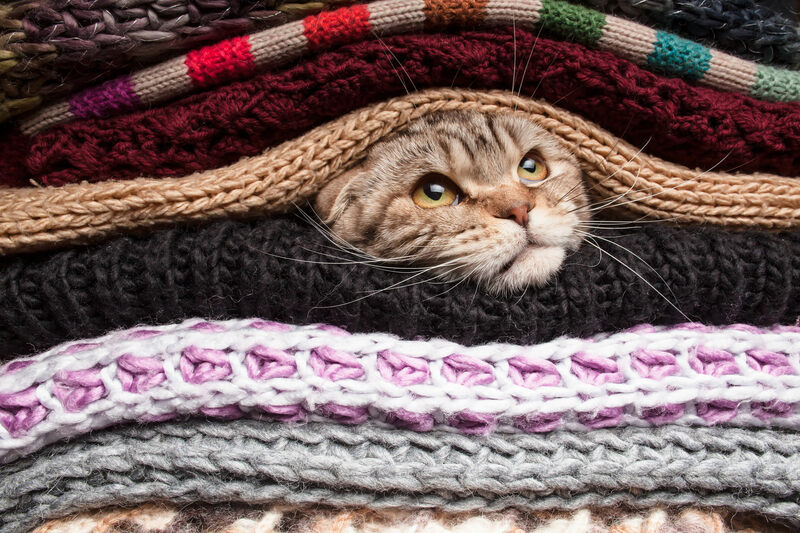 It's literally just a big pile of blankets, with just your character's face poking through. Hello! I'm a mount addict, and I've had some random ideas float through my head that folks have suggested I share here. I'll list out the ideas I've had below. A plush griffon skin, like the little toys but riding size! An underwater bubble, like the gliding skin but mount speed! Formula for success: Rise early, work hard, strike oil. I've been waiting and hoping for the mini claim tickets to bring back the Braham Eirsson mini for months on end.